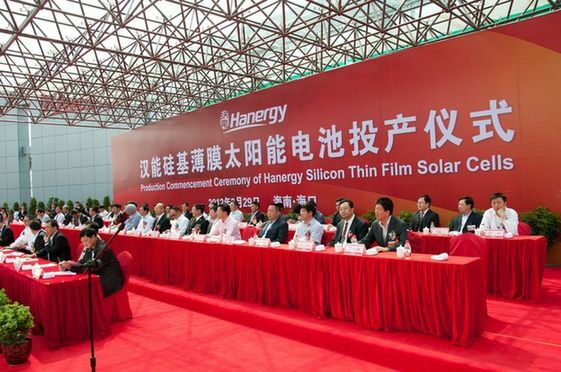 Hanergy Holding Group, one of China’s leading privately-run manufacturers of clean energy products and contractor of and clean energy projects, began production Thursday of thin-film solar cells. The company is producing the solar cells at its plant in Haikou, capital city of China’s southernmost province of Hainan. The annual production capacity of the company’s Haikou plant will reach 250 megawatts (MW), and will later be raised to 1000 MW, according to the company. According to one industry insider, who spoke on condition of anonymity due to the "sensitive implications of any comments made", said that Hanergy’s new project would raise the company’s overall annual photovoltaic (PV) capacity to around 2GW, making it the world’s largest thin-film PV cell manufacturer". 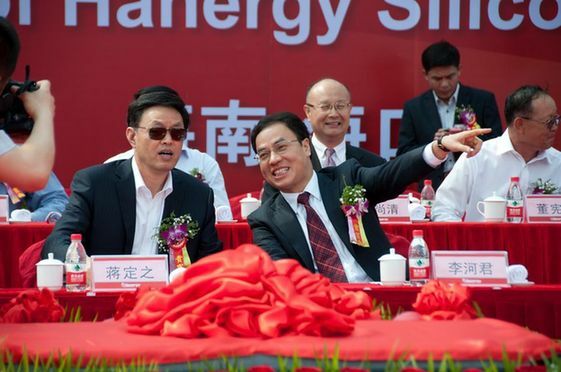 Hanergy has publicly stated that its Haikou plant will generate a gross business turnover in excess of 2 billion yuan (US$316.45 million) during its initial period of operation, a figure which it says will quintuple by the end of China’s Twelfth Five-Year Plan (2011-15). Commenting on the project’s wider potential at the Haikou plant’s production commencement ceremony, Hanergy group chairman Li Hejun said: "When the project is fully fledged, it will create 5,000 new jobs." He went on to state that the PV application of solar energy has huge market potential. "Solar energy isn’t merely a supplement to traditional energy," he said. "It has already started to replace traditional energy on a massive scale." Hanergy is already an industry leader in China in terms of pioneering building integrated photovoltaic (BIPV), in which solar cells are integrated with buildings. The cells generate enough electricity to serve all of the buildings requirements, thereby reducing dependence on fossil fuels. According to Li, BIPV has a potential installed capacity of 5 million KW throughout Hainan Province, which means that it can provide 30 percent of the island’s total power demands. Li is also enthusiastic about BIVP’s potential in the fight to cut carbon emissions. He said: "In addition [to providing power], BIPV in Hainan will reduce carbon emissions by seven million tons." It also appears as though Hanergy is unaffected by certain wider concerns currently affecting other Chinese PV producers. On March 20, the U.S. Department of Commerce ruled that Chinese PV projects’ exports to the U.S. would be subjected to a tax of between 2.9 percent and 4.73 percent as a result of the recent anti-dumping and anti-monopoly investigation.